For the past three years, Blueprint magazine has devoted the back page in each issue to Paper City, inviting artists, illustrators, architects, and designers to put forward their ideas about how the modern urban environment should be shaped. There are no concerns about viability nor respect for the laws of physics — this is a paper city, after all; contributers are encouraged to be as wildly creative, as insouciantly improbable, or as defiantly anti-establishment as they like. The 44 designs have now been collected in a small but inviting show at the Royal Academy. Paper Cities: Urban Utopias shows how the simple brief has spawned ideas that take in a broad range of styles and approaches. There a definite sense of a utopian rather than dystopian attitude, a theme hinted on by Inez de Coo, whose montage of Fifties-inspired icons of the hi-tech age, all glass spires and airships and Jetson-style personal craft, comes with a knowing legend: "At least it was hopeful!". Sergei Sviatchenko offers up a confusing, wholly implausible mix of urban sprawl strung alongside raging ocean, with the giant ear and fist of some deity hovering above proceedings. London-based graphic designers Bibliotechque submit perhaps the most practical idea: they propose replacing the city's current street signage, which varies from council to council, with a uniform, modular scheme laid out in a clear and consistent manner. As if to underline the importance of print (Blueprint is a magazine after all), the designs are mounted on stacks of paper on the wall, and a copy of each can be torn off and taken home by visitors. A nice idea, and perfect for decorating that space in the living room behind your Alvar Aalto chaise lounge, but unfortunately this does mean that the displays are obscured by dozens of assymetrically haircutted students grabbing what they can and stuffing it into Cass Art tote bags. Those inspired by the exhibition, and who wish to try their own luck at conjuring a Paper City, can enter the Blueprint competiton, which is open till Monday 2nd November, and features a Zaha Hadid-designed vase, as sold in the RA's shop, as the prize. 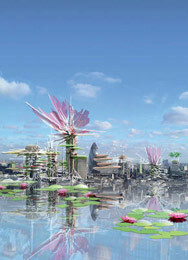 Paper Cities: Urban Utopias, at the Royal Academy, until 27th October. Entry is free.